Second base for the Cincinnati Reds is a little bit murky when we look into the future. After a decade-plus of former All-Star Brandon Phillips manning second base, the 2017 season was supposed to be the one where Jose Peraza took over the spot. And that did happen, briefly, but his struggles combined with the breakout of waiver pick up Scooter Gennett led to a switch in plans. Despite a big season from Gennett, the Reds have their top prospect, a third baseman as a professiona, Nick Senzel, working at second base. They also have another of their Top 10 prospects at second base in Shed Long. And none of that includes another second baseman that the team has in Dilson Herrera, who they traded for in the 2016 season when they moved Jay Bruce to the New York Mets. To put it bluntly, they have a lot of options at second. In Triple-A last season there were three guys who saw 29+ games at second base. The previously mentioned Dilson Herrera, Darnell Sweeney, and Alex Blandino. 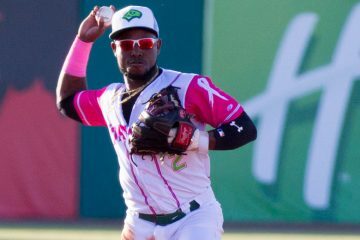 For the purposes of this series, we are only looking at players that qualify as prospects, which eliminates Dilson Herrera as he has too much big league time. Darnell Sweeney can play a little bit of everywhere, but I will look at him more as an outfielder in a few weeks. That leaves Alex Blandino. The former 1st round pick began the year in Double-A Pensacola. 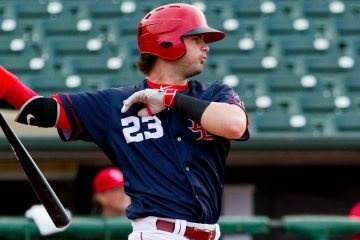 After a cold stretch of a few weeks to start the season he started to put things together and earned a promotion to Louisville midseason after hitting .259/.374/.462 for the Blue Wahoos. Once in Louisville he picked up where he left off in Pensacola. Blandino would .270/.390/.444 in the second half. While he plays multiple positions, defensively it’s second base where he’s the best. Offensively he’s got a good understanding of the strikezone and there’s a little bit of pop in his bat. When Alex Blandino moved up to Triple-A it was Shed Long who jumped up to take over in Pensacola. But, in the first half Long was in Daytona terrorizing pitchers to the tune of a .312 average with a .380 on-base percentage to go with a .543 slugging percentage. The power showed up in a big way for the infielder in the first half. With his promotion to Double-A he saw some initial struggles. His wrist began to act up and he would miss out on most of the month of August before returning for the final week of the regular season. With the Blue Wahoos he lowered his strikeout rate, and he also drew more walks, but the hits just didn’t find the grass as often as they did at his previous stop. He would post a .227/.319/.362 line in the second half. The power is there, he’s got more speed than his nine steals in 2017 would suggest and he’s a much better hitter than the .227 average in the second half says. Brantley Bell began the year in Dayton at second base. 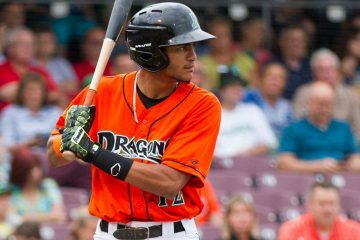 It was his second year with the Dragons. His power stepped forward in 2017 with Dayton, with 13 doubles, a triple and two home runs in 63 games. He also stole 15 bases in the first half. However, he did hit just .240 with 21 walks and 72 strikeouts in 63 games played. When he moved up to Daytona the power dropped off, with just six doubles and a single home run in 62 games. He did cut his strikeout rate significantly (it was 25% lower, going from 28.1% to 21.1%), but his walk rate was also down significantly. Like in Dayton, he was successful on the bases, stealing 14 of 16 bases, giving him 29 total between his two stops. After Brantley Bell was promoted the second base spot in Dayton was manned by several players. No one else on the team spent more than 23 games at the spot other than Bell, though. Jumping down to Billings the majority of the playing time went to Alejo Lopez. The switch hitter was making a return to the Mustangs. The season went much better in 2017 for the 21-year-old, posting a .300/.388/.455 line. In each of his three years since being drafted, Lopez has walked more than he’s struck out. The big difference in 2017 was that he started showing more extra-base pop. In 2016 he managed just eight extra-base hits in 57 games. During 2017 he had 20, including four home runs. He only had one home run through 69 games in his career entering the season. There’s not a bunch of power to tap into for Lopez, but he makes tons of contact and walk more than he strikes out. He’s also got some speed to work with. In Arizona most of the playing time went to 4th round draft pick Cash Case, who started 29 games. The 18-year-old struggled at the plate and in the field in his professional debut. He hit just .180/.273/.241. He had a good walk rate and his strikeout rate was solid, but the hits just didn’t come in his 34 games played (he made five starts at designated hitter). In the field he made 10 errors and posted an .865 fielding percentage. While the debut wasn’t what you wanted to see, he’s got some tools to work with, particularly at the plate. You may notice that I didn’t write up Nick Senzel here despite mentioning him near the top of the article. For the grading portion below, I’m going to consider him partially here, which will boost the grade some. But, I still think it’s worth considering him more as a third baseman until he actually goes out and plays some second base on the field as a professional. But, even behind that, there’s plenty of depth at the position. Shed Long gives you a Top 10 prospect in the organization. Alex Blandino gives you a second top 25 guy and one who has found success in Triple-A and could be on the verge of the Majors. In the lower levels you’ve got some potential, too. From the absolute top at the Major League level to the bottom, it could be the deepest position in the organization. With the overall depth, a top end prospect and a half, and a solid spread of the depth throughout the system, second base is a solid B+. If we were fully counting Senzel it would bump the grade up a little more. With regards to the fielding, there are a few different opinions on who could claim the top spot there. Blandino’s arm stands out at the position though, which led to me giving him the edge. But it is the Beavers who are #1 or #2 going into the year. Lots to like again this year. Madrigal probably does not fit here with the 5 th pick though given this log jam that is 2nd base. State of the organization- A++++ and best in all of baseball. Senzel is a top 5 second baseman at MLB level today imo and as of today, 2nd is where he’s heading if called up. I’ve always been a fan of Scooter Gennett. He had a great start to his career and now is coming into his prime years. From what I read, and correct me if I’m wrong, the “juiced” ball is a product of modern baseball development process and there’s really not a clear fix to it so I think scooter can reproduce those numbers minus the rbi total. If so, he’s a great anchor on the team that has tons of value and creates quite a predicament when senzel is ready AND what you do w herrara and blandino?!? Good problems to have! 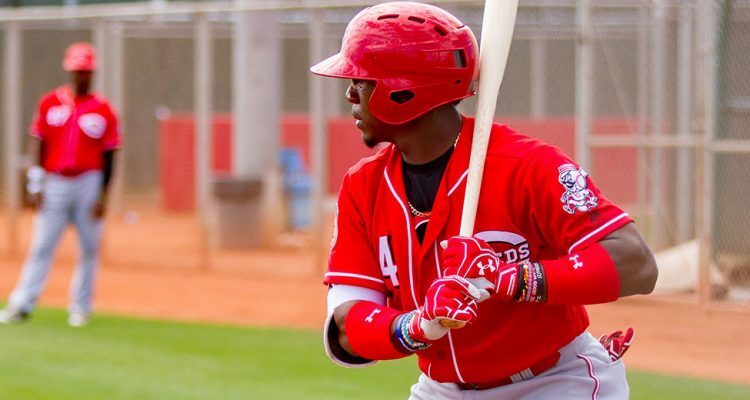 If Scooter and Mesoraco and the 4 outfielders are used properly, with Dilson, that could be the best bench we have had in decades. I agree Wes. Gennett is not moving unless he is traded. Suarez will be tough to move. My gut tells me that come June the Reds have to decide how the Peraza to SS experiment is going. If this is successful the Reds have a problem in that their best prospect has no place to call home in the majors. If it isn’t successful, Suarez moves to SS and Senzel becomes a 3B. The problem is that both Suarez and Gennett were among the top 60 producers in offense last year (offensive war per fangraphs). Tough to bench either of them even for one of the best prospects in baseball. So unless a trade or injury happens or Suarez moves back to SS, Senzel is will be in Louisville. 1. I thought Blake Trahan was primarily a 2B. Do you just not see much to be excited about? 2. I love these posts but have you thought about adding like a minor league depth chart to each position? Maybe where they finished or who you think will be where? Just a thought and I know it would be beneficial to me. Trahan’s been at shortstop his entire career. But, he OPS’d under .600 this year. He’s got to do better than that if he’s going to be in the conversation as a starting option. I’d say RH pitching is the deepest talent in the organization. The 2B position is 2nd deepest. But when you consider moving some of the SS prospects to 2B it might then become the deepest. After Blandino and Long, the 2B position doesn’t look all that good. Lots of potential and short on performance below AA and Long. Got to see more from Case in 2018. Are Downs and Garcia going to stay at SS? Doubtful on both, and both are at the top of the SS rankings. The all-glove SS’s have little to no sticks. And the SS with sticks are lacking in the glove department and considered more suited for another position, notably 2B. The Reds invested $17M and a 2017 1st round/CB pick in the SS position in 2016-2017 and have next to nothing to show for it so far. Williams said that Garcia was the equivalent to a mid-first round draft pick in 2017. We shall see. The Reds might need a Brendan Rogers type to surface before the 2018 draft to snag at #5. There appear to be SS available in the draft that are not a reach at #5. Things will change a lot over the next 5 months so that could change. That said I am comfortable with Garcia and Downs. I think there is a good chance Garcia moves into the top 100 prospects overall next year. I think there is a chance Downs jumps into the top 100 also. His year in Montana was better than Trammell’s and Trammell is a top 50 prospect. Everything I have read says Garcia can stick at SS. Beginning mid-season this year I feel the Reds are set at SS for the next 9 years. I really think the Reds need to move Suarez to make room for these guys. I think he has all-star potential and could bring back something really valuable. The Reds have so much depth when it comes to 2nd and 3rd base I feel like they really need to deal from that to address the rotation or CF\SS. I would hate to see him go, but his value is in a pretty prime spot right now. Not sure who they could package him with or who they would target (really wish it could be Archer), but I say put Senzel at 3rd, Long\Herrera\Scooter at 2B and then Blandino as util. Honestly that is just an insane amount of depth when looking at it objectively. So much depth at 2B. One of my big beefs about this slow offseason is that there’s not enough playing time to go around for some of these guys. Trading off some redundancies to bolster the ML roster would be prudent, yet all I hear are crickets. Maddening! So given the market- what’s a scenario? Gennett for 1 year of Matt Harvey? Guess that would be ok, but imo, that’s as bout as much as you get and you recreate a larger log jam at starting pitcher. Long has some value, but he doesn’t loosen up log jam. From herrara to blandino to even gennett- there is little to no trade value in the whole group- so what would you do? The Stanford Cardinal must have had a great year defensively to surpass Brantley Bell who was tremendous defensively the first half at Dayton. it was a big reason for Dayton’s first half success and his leaving created a defensive void the second half.